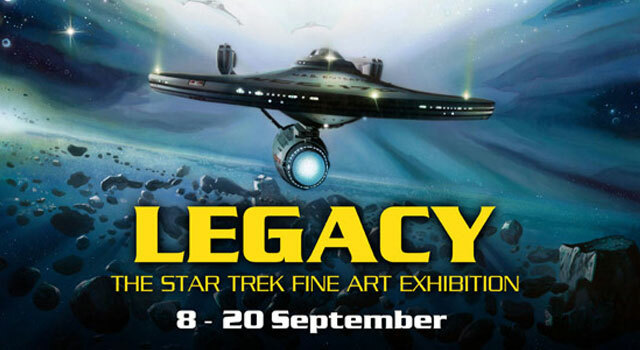 Generation Pop, an award winning art gallery located in Manchester, UK, will host an art tribute to Star Trek‘s 45th anniversary next month entitled Legacy: The Star Trek Fine Art Exhibit, which opens on Thursday, September 8th and runs through September 20th. The event is free to attend, however you must email the gallery to be added to the guest list. The exhibit will feature artwork from a myriad of official Star Trek artists from all over the world. More information from Generation Pop below. Star Trek celebrates it’s 45th anniversary this September and Generation Pop has been asked to host the official Star Trek fine art collection. The opening night event is on Thursday the 8th of September (the actual anniversary of the show) and tickets are free, however you will need to call the gallery or email us at generation.pop@googlemail.com to be added to the guest list. If you own a Star Trek uniform then why not wear it on the opening night, the press will be there and I am sure they would love to take your picture. The exhibition itself lasts until the 20th of September and is free to attend. The collection includes work by a number of official Star Trek artists who actually work on the Trek TV shows and films. The exhibition is being sponsored by Fab Cafe, the worlds first movie, cult TV theme bar. For further information please call 0161 247 7870. For more information, visit Generation Pop.